Apple is very concerned about how it’s seen by the outside world. After all, it affects profit. So when a number of respectable media outlets began reporting about the potential for its iPhone 6 and 6 Plus phones to bend in pockets, the tech giant took them on a tour of its “torture testing” facilities, where it bends iPhones all day long. As hacking evolves and attacks become more sophisticated, the threat continues to escalate, writes Patrick Kingsley. For two reasons, this was a surprising piece of journalism. First, Tupac died in 1996. Second, the piece wasn’t written by PBS. It had been planted on their site by a group called Lulz Security, a loose collective of anonymous hackers who wanted revenge for a recent PBS program that criticised WikiLeaks. A message from Lulz Security. The extraordinary episode was by no means isolated. In March, hackers stole a database of email addresses from the marketing group Epsilon in what one commentator called the largest email address heist in history. Then the computer security firm RSA had their servers breached in an attack that may have led to the hacking of defence giant Lockheed Martin, an RSA client. In April, persons unknown cracked Sony’s PlayStation network and stole 77 million users’ data. And in the past month, the IMF, Citibank, the Spanish police, Google, the Turkish and Malaysian governments, the US Senate and (earlier this week) the CIA have all been hacked. In simple terms, there are three kinds of attack taking place. 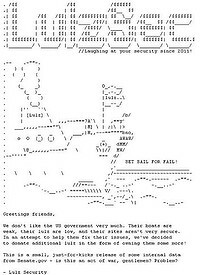 Hacktivism is the most prominent: raids by amateur groups such as Lulz (who took down sites belonging to the CIA, the Senate and the Spanish police) or Anonymous (PayPal, PlayStation, MasterCard and Visa), for fun – ”for the lulz” – or, increasingly, as an act of political protest. There is the criminal kind: professionals hunting for credit card details or email address directories. Finally, there’s state-sponsored espionage, or even cyber-warfare. ”Google, RSA, Lockheed Martin, IMF – the strong suspicion is all those were state-sponsored, or state-approved,” Dave Clemente, a cyber security expert at Chatham House, the international affairs experts, said.. If increased openness in part accounts for the apparent hike in hacking, there has still been an exponential rise in cyber threats. In 2008, security giant Symantec counted 120 million malware variants; last year, that figure was 286 million. Symantec security strategist Sian John has also noted a large increase in ”targeted attacks”. Hackers are using a new tackle called ”spear phishing”, which enables them to be more specific about who they target. ”In the past, if you got a phish attack, it would be from a Nigerian offering you lots of money,” said John. ”Now it’ll be from someone saying: ‘Oh, we saw you at that conference last week. Here’s some minutes of that conference’.” Contained within those minutes will be a virus. It is tempting to think of this kind of debate as irrelevant to our everyday lives. Symantec says mobile phone technologies will be hacking’s next target, and perhaps it is physical problems such as this that we should be more concerned about. But as we increasingly live more of our lives online, and as that boundary between physical and virtual is increasingly blurred, perhaps it is the conceptual questions posed by hacking that will prove more significant. Would you stop your iPod to cross the road? Are people in NSW prepared to put down their iPods, mobile phones and other electronic devices while crossing the road? NSW Police said it would support laws banning the use of iPods, mobile phones and other electronic devices while crossing the road and while riding bicycles. It is the latest attempt to improve traffic safety by legislating against technological distraction, but questions have been raised over whether such rules could ever be properly enforced. In New York, a bill is pending in the transport committee that would ban pedestrians, including joggers, from using gadgets while crossing the street. Lambs to slaughter … the image used in the Pedestrian Council of Australia’s campaign. Other states including Oregon, Virginia and California are moving to ban devices such as iPods from being used while riding a bicycle. Culprits would be fined between $US20 and $US100. Similar legislation has yet to be introduced in Australia but NSW Police said “should legislation such as that described be introduced, it would receive our support and ongoing attention”. The position is a marked turnaround from the views of NSW Police State Traffic Commander John Hartley, who said in 2007, when the US laws were first talked about, that “you can’t legislate stupidity”. The reason for the change in position is unclear – national pedestrian road deaths have been falling consistently, from 351 in 1996 to 173 last year. In NSW, there has been a slight rise in pedestrian road deaths from 59 to 64 between 2009 and 2010, the RTA says. 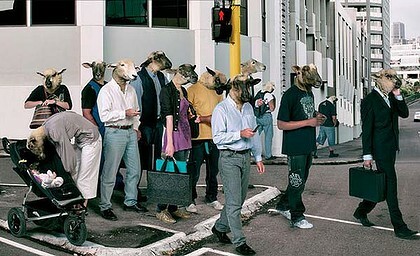 The Pedestrian Council of Australia has been running advertisements showing people with lamb heads using their gadgets while crossing the road at a red light under the banner “Lambs to the slaughter, wait for the green”. The council’s spokesman, Harold Scruby, said there should be a much stricter legislation and enforcement campaign to complement his awareness campaign. He also said device manufacturers had a “moral and corporate responsibility” to put warnings on their mobiles and music players. In September last year a 46-year-old Sydney woman from Glebe was knocked down and killed by an ambulance – reportedlywhile wearing headphones – as she crossed Parramatta Road. “They put you in la-la land, aside from the fact that, if you’re using two buds you’ve lost the stop, look and listen awareness of things around you,” Mr Scruby said. He also criticised current laws that allowed drivers to operate vehicles and bicycles with an earbud in each ear (“they don’t hear tooting, fire engines, police vehicles, ambulances … “) and said police were generally not enforcing laws governing people crossing roads. “You step off the footpath against a red light in America and they book you [but] in Australia they don’t touch you – you see cops standing next to people who are walking against the lights,” he said. Already, Australian motorists face significant fines and three demerit points for driving or riding a vehicle while using a mobile phone, even when stopped at traffic lights. Hands-free kits are allowed but not “if it causes you to lose proper control of your vehicle”, the RTA says. People with learner or P1 provisional licenses are prohibited from using their phones while driving, with or without a hands-free. But with drivers now gadget-free, attention is turning to pedestrians and their risk of walking into oncoming traffic while zoning out with their music players or sending texts. The ability of mobiles to distract people from the outside world was brought home to a global audience this month when a US woman tumbled head first into a shopping centre fountainwhile texting. She later threatened to sue the mall. The New York senator who has been pushing the new rules for pedestrians, Carl Kruger, said people could not be fully aware of their surroundings while “fiddling with a BlackBerry, dialling a phone number, playing Super Mario Brothers on a Game Boy or listening to music on an iPod”. He cited a rise in “accidents stemming from pedestrian distraction”, including the death of a 21-year-old man crushed by a Mack truck while listening to music. In Australia, official figures do not allow one to drill down to see the number of people killed or injured while distracted by their gadgets. However, according to the Department of Infrastructure, 173 pedestrians were killed on Australian roads last year, down slightly from 195 in 2009. NSW Police said the community should be mindful that road use – whether as a driver, rider or pedestrian – was a complex task requiring alertness, awareness, compliance with the road rules and good judgment at all times. “Any distraction from the task of safely using our roads has the potential consequence of reducing road safety and for that reason we encourage all road users to apply their best efforts and full attention to the task at hand when on our roads,” it said. Spokespeople for the NSW Police and transport ministers directed requests for comment to the office of the Roads Minister, David Borger.